Reflections and Ruminations: Zacchaeus' short story goes a long way. It's our story too. Zacchaeus' short story goes a long way. It's our story too. Whenever I am invited by my parishioners to bless their homes, I like to do several things. I often take with me two things (apart from my trusty bottle of Holy Water) – a spiritual book written by Fr Ronald Rolheiser, and a Holy Bible. I read from them one of Fr Rolheiser’s reflections on how a blessed home can be a blessing to the people who live in it. It has lots of gems of truth that are gold. The scripture reading that I often use comes from Luke’s account of Jesus encountering Zacchaeus the height-challenged tax collector. Through the years, I have come to appreciate this passage with greater and greater clarity and depth. It never fails to remind me that we are, all of us, variations of Zacchaeus in different times of our spiritual lives. Zacchaeus, we are told, was diminutive in size. Luke is graphic in telling us that he had to climb a sycamore tree in order to get a glimpse of Jesus who was about to pass his way. Grown men don’t climb trees. 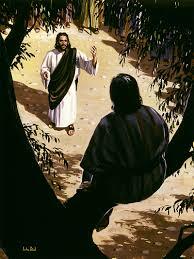 But Zacchaeus was doubly challenged. Not only was he short, but there was the presence of the crowd that made it even more wearisome a task. He did not allow these to quell his need of seeing Jesus. This applies so aptly to each one of us. We all have obstacles in our lives from seeing God who passes our way each day. Some obstacles are inherent (it’s called sin), and some are placed in our way and can come in many forms like people and circumstances. Our own variegated past can easily hinder us from getting clear views of God’s working in our lives. Zacchaeus’ pluck is of essence here. He overcomes his obstacles and climbs the tree. Singapore, like many developed cities in the world, is becoming crowded at an alarming rate. We are also so familiar with crowds. But the kind of crowd that impinges on our search for truth and for God can also be in the ‘crowd mentality’, in the prevailing sentiments of atheists who decry God’s existence and presence in the world. These voices can also crowd out one’s attempts at find out ‘who Jesus is’. Innovative and resourceful, Zacchaeus then climbs the famed sycamore tree. This is where my reflection becomes a pointed asking of the new home owners to dare to become ‘trees’ for the many seekers of Jesus to allow others to use them and ‘climb’ on them so that these searchers can get that glimpse of Jesus through their own lives of faith. We don’t particularly like to be used and stepped upon. Yet, we know in our hearts that oftentimes when we are open to being made usable by God, we are also asked to become resilient to the ways in which others experience kindness and charity through our very lives. And if we stretch this over time, it can sometimes feel as if our goodness and kindness is being stepped on or abused. But that only applies when we have lost our focus on being true disciples of the Lord. One of the very palpable fruits of prayer is when we realise that our gifts and skills are not meant for us to flout and lord it over others, but to magnify God’s presence and grace in the world. I understand it when I hear laments of people who feel that they are being used and taken for granted by loved ones and friends when they are Christ-like. If we are reflective and honest, a deeper revelation often shows that feeling this way often comes about because of an inner security in ourselves and our worth in God’s eyes. Finally, Jesus, we are told, insisted on staying with Zacchaeus and makes that first move to want his company. And the crowd (which may well include Jesus’ own disciples) grumbled and complained. At that point, the crowd became the ones who were small - small in heart, small in mind and small in charity. When we cannot share and enter into the joy of others who are blessed, but gripe, compare and become derisive and dismissive of others, our participation in the kingdom of God diminishes. And when we catch ourselves enjoying waves of secret happiness at the failings and shortcomings of others, it is our egos that are telling us that we are actually better than others, schadenfreude is our sin, where we literally bask in a ‘harm-joy’ as if it were sanctioned. If the life of a dedicated Christian is challenging, difficult and arduous, the life of a searcher of the truth is doubly so. A priest’s role has to be one that constantly encourages the faithful to rise to the challenge, overcome the perceived fears and to walk that route which is less travelled. Last week’s revelation of my condition resulted in so many of your readers telling me that my weekly words have been a positive influence in your faith life. I can only thank God that his grace has allowed me to see the bright and positive side of things like afflictions and adversities, and pray that I can continue to be usable in his kingdom despite my limitations. May this be your possibility as well. I will be away on vacation and as such, there will not be any blog posts until 9 May. Everybody can benefit from a recharge from time to time. My time has come, and when I return from it, I pray that I will be usable by God in new and powerful ways for his people.